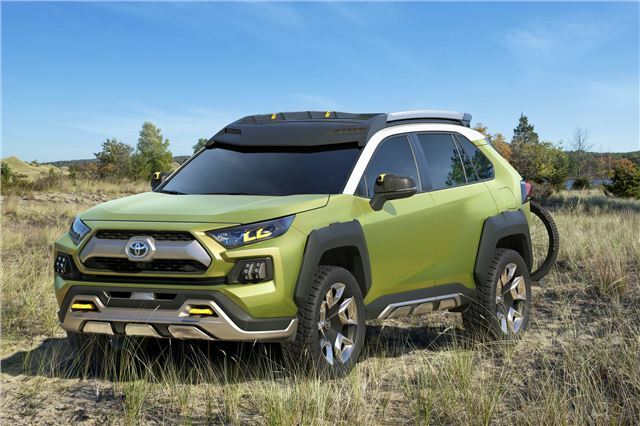 The FTAC Concept is an outdoor activity SUV, harking back to the original Honda CR-V, RAV-4, etc., but more rugged, that will probably be the basis for a future production model 4WD SUV. A few years away from production. Toyota 'Future Adventure Concep't (FT-AC) shown at Los Angeles Auto Show December 2017 as an SUV designed for adventurous outdoor activities. As well as being engineered for expeditions on and off-road, the FT-AC has the gimmicks of built-in cameras and a WiFi system that lets journey footage be instantly available for remote editing and live online streaming. Lights and cameras can even be detached from the vehicle to extend the adventure beyond what’s possible on four wheels. The vehicle’s design references Toyota’s current range of SUVs and pick-ups. The wide, black front grille is flanked with bright LED headlamps, while the fog lights can be removed from their pods and used as a portable lights, for example fitted to a mountain bike for a night-time ride. The designed-in practicality includes twin hooks for vehicle recovery and robust skid plates to protect the front and rear overhangs when traversing rough off-road terrain. The FT-AC has a long wheelbase, wide track and high ground clearance, which emphasise its powerful stance. Extra wide wheel arch protectors safeguard the bodywork and appear to float above the 20-inch wheels, shod with all-terrain tyres. A safari-style roof rack system can carry all types of adventure gear and is fitted with rear-facing LED lights that can be operated remotely. LED marker lights can provide ambient lighting around the vehicle, give extra forward illumination, or even act as a flash for use with cameras embedded in the door mirrors. These infra-red cameras can record the FT-AC’s off-road journeys and, like the front fogs lights, can be removed and mounted off-vehicle so that no aspect of an adventure need go unrecorded. An integrated WiFi hotspot automatically uploads footage to cloud-based storage where it can be accessed for real-time editing and posting, using a mobile device. The fun can even be streamed live as the journey unfolds. A retracting, integrated bike rack (as once offered as an option on the Vauxhall Mokka) can be hidden from view in just a few seconds. The FT-AC also has a geolocation function that can automatically provide directions back to base camp. Although the showcafr is a design concept, it has been imagined as a thoroughly capable vehicle that makes use of an advanced all-wheel drive system with torque vectoring. This allows power to be routed exactly as required for excellent vehicle control and maximum traction. Variable terrain-response settings and a four-wheel local function add to its capability, managing traction control and throttle response to maximise grip at each wheel. FT-AC is petrol-powered but could accommodate a next generation hybrid powertrain that combines fuel efficiency with rugged, all-wheel drive grunt.